Firstly, just so you all know – I’ve invented a new word for the purpose of this weeks song. 1. A combination of ‘stick around’ and ’roundabout’. 2. To stay with someone through the ups, downs, twists and turns of life. It’s 00:14 on Friday morning and I’ve spent the last hour wondering wether or not to go out on a limb and name this weeks song after the word I just made up. ‘Stickaroundabout’. As you can see, I’ve bottled it! This weeks song is an old verse idea I wrote with my mate Tel (said in a cockney voice) that was originally called ‘Stay With Me’. The ‘Stay With Me’ part came from the chorus (which didn’t quite cut the mustard) and so once it was re-written we needed a new name. A couple of weeks ago there’s no way I ‘d have called this song ‘Trains and Buses’ because I already had another song called ‘Trains and Buses’… but seeing as ‘Trains and Buses’ became ‘If I Die Tomorrow’ in week 29 and ‘Stay With Me’ had a lyric about trains and buses in the chorus it seemed like a logical way to round it all off. Confused? So am I. ‘Trains and Buses’ (formerly ‘Stay With Me’) is about being with someone who makes you’re day brighter and is a collaboration with a chap called Terry Martin. Always cracking jokes (usually naughty ones). Used to be the songwriter in a band called Alisha’s Attic. I used to listen to my sister listening to Alisha’s Attic back in the day (“I am, I Feel’ – what a tune) so it’s nice to wind up in the last half of 2012 about to release a Frank Hamilton / Alisha’s Attic collaboration. We wrote the better part of it last year before coming back to it recently and revamping the chorus before I set about recording it this week at onesongaweek HQ (aka in my lounge). This week’s song also features the lovely lungs of Holly Drummond (who I spoke to for the first time on the phone less than an hour ago)! I needed a female voice and happened to be sitting with a chap called Giordano who suggested Holly and played me some of her stuff. A few emails and some remote recording later (she’s based all the way up in Scotland!) and week 31 was sounding ten times better. It’s odd how these things happen so randomly and so quickly. A few days ago I had no idea who Holly Drummond was (and vice versa!) but now we’re bound together in #onesongaweek history. Crazy talk. 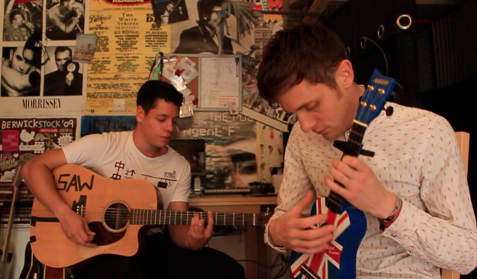 In other news here’s a photo of me and Jacob doing a one-take performance of ‘Typewriter’ from last week. Keep your eyes peeled for a video on Youtube in the next day or two. Frank, your songs always make me smile… Thanks!